Democrats have often claimed to be the reality based community, citing many false beliefs held by Republicans. For example, a poll as recent as 2015 showed that half of Republicans still believed that WMD had been found in Iraq. Gallup shows that Democrats are doing even worse regarding false claims being used to promote neocon goals. A Gallup poll released August 20 shows 78% of Democrats believe not only that Russia interfered in 2016 election but that it changed the result, despite a lack of evidence for this view. As with false views about WMD in Iraq, false views by Democrats about the 2016 election have negative consequences. Democrats are using the belief that Clinton lost because of Russian actions to avoid necessary reform in the party. Democrats must face reality, accept responsibility for their losses, and reform their party, as opposed to dwelling on conspiracy theories blaming others. Rigging the nomination for a candidate as terrible as Clinton cost the Democrats about 10% of the vote and is the main reason they lost in 2016–not any foreign interference. Even worse, this has led to a more hostile view on foreign relations by Democrats. The same poll found that, “Americans believe it is more important to try to continue efforts to improve relations between the countries (58%), rather than taking strong diplomatic and economic steps against Russia (36%).” In contrast a majority of Democrats (51%) favor taking steps against Russia while 45% believe it is more important to continue efforts to improve relations. Hysteria over Russian bots and “fake news” has also led to an increase in censorship of Americans on social media, as I most recently discussed yesterday. A majority agree that Russia did interfere in the election. This is hardly surprising considering that Russia has meddled in our politics for decades, just as the United States has meddled in elections in Russia and around the world. I find that many Democrats have difficulty separating the different aspects of this. They see legitimate criticism of Trump’s policies as somehow being proof that Russia changed the result of the election, or fail to distinguish between low level meddling and actually altering the result. Some of this comes from misinformation deliberately spread by Clinton and the DNC to distract from the reasons for her loss. 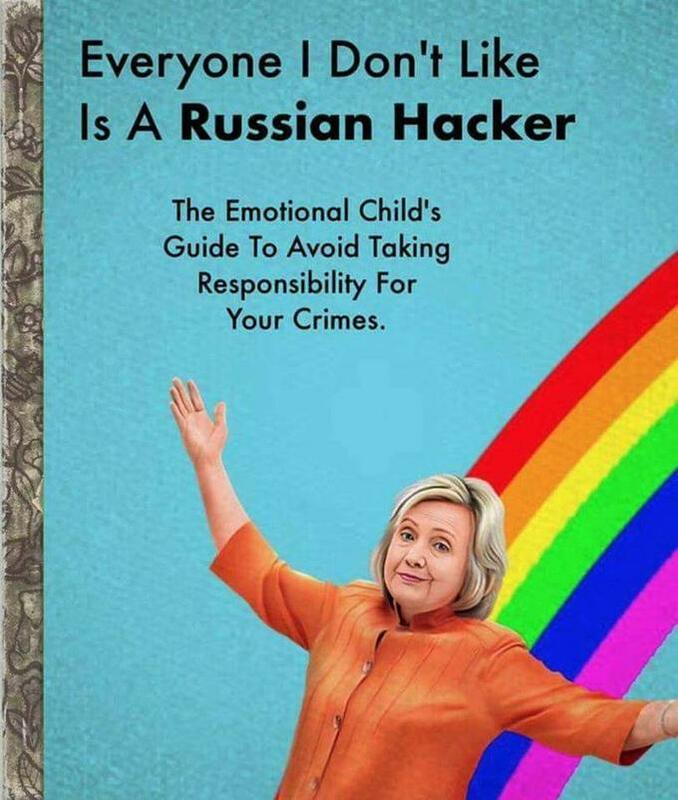 As was revealed in Shattered, Hillary Clinton decided upon the strategy of blaming others such as Russia for her loss within twenty-four hours of losing. The Washington Post exposed the fact that the Clinton campaign and DNC had paid for the Steele dossier, after they had denied their involvement for months. We also have often seen false information being repeated, even after retracted. Today we saw one of many false claims being retracted, this time a claim from Democrats about a hacking attempt turning out to be a false alarm. I’ve repeatedly found that Democrats will continue to cite the original incorrect stories without realizing they have been retracted. This includes the repeated incorrect claims about seventeen intelligence agencies, and incorrect reporting regarding hacking of voter databases. I listed additional examples here, and The Nation has also debunked the irresponsible media coverage of claims about Russia. Just as many Democrats are quick to accept any excuse for Clinton’s loss, many reporters who had predicted Clinton would win easily prefer to blame her loss on Russia, rather than admitting they had totally misread the election. In reality, signs of Clinton’s weakness in the battleground states, among independents, among liberals, and among young voters was apparent even before she was nominated, as I had warned in multiple posts. Evidence from the Congressional investigations showed that the Trump Tower meeting, while possibly a violation of election laws, was of little consequence. No evidence came up showing any evidence that any votes were changed during the Congressional investigations. The hearings revealed that Russian ads and propaganda accounted for a minuscule portion of overall Facebook content, representing “less than 0.004 percent of all content — or about 1 in 23,000 news feed items” on Facebook. Over half of the ads were not seen until after the election, most had nothing to do with promoting Trump over Clinton, and the ads were more concentrated in safe blue or red states as opposed to the battleground states. The various guilty pleas and indictments from Robert Mueller have dealt far more with crimes such as money laundering and tax evasion as opposed to anything which involved the election. Some indictments were for violations of campaign law, and others were for allegedly hacking the DNC, with neither claimed to have altered the election results. With the DNC having refused to allow the FBI to investigate their computers, there remains question as to whether the release of email was really a hack or a leak. Even if a hack, there has been no question as to the validity of the email released by Wikileaks. Blaming the loss of the election based upon the release of factual information which exposed dishonesty by Clinton and the DNC is hardly a meaningful excuse, and the blame for the loss still falls on Clinton and the DNC. Democrats must face reality as to why they lost the 2016 election and make necessary reforms in the party–including reforming the nomination process at their meeting this week where super delegates are under consideration. Rigging the nomination for a candidate who could not win the nomination fairly on her own both alienated many potential voters, and left the Democrats with a candidate too unpopular to beat even a candidate as dreadful as Donald Trump. Posted in Congress, Donald Trump, Hillary Clinton, Iraq, News Media. Tags: Donald Trump, Hillary Clinton, Iraq, Robert Mueller, Russia, Shattered, Weapons of Mass Destruction, Wikileaks. RSS feed for comments on this post.. TrackBack URL. In a way, Hillary created the #Walkaway movement. Jim Mooney: There is no "#Walkaway movement." It's completely fake. Also, anyone who thinks the Democratic nomination was "rigged" is stupid beyond words. And Russia's meddling in the election went far beyond just Facebook posts. It would have been better to use #DemExit. But Cal’s error is far worse. It is utterly ludicrous to claim Russia changed the results of the general election while also denying that the Democratic nomination was rigged. The post already demonstrates that there is no evidence that Russia altered the election results. Does Cal deny that there were superdelegates? That Democrats intentionally front load southern primaries on Super Tuesday to affect the outcome? That the Democrats essentially gave Clinton control of the party before the primaries as Donna Brazile admitted? That the Democrats changed the fund raising rules during the campaign to help Clinton? That Harry Reid played games in Nevada to help Clinton, while claiming to be neutral? That the DNC limited debates at the request of Clinton? That Tom Perez, Donna Brazile, and Elizabeth Warren have all stated that the nomination was rigged for Clinton (before they were pressured to walk back their statements)? That the DNC’s own lawyers admitted it was rigged in court, arguing they had the legal right to rig their nomination? The 2016 Democratic nomination was rigged for Clinton every bit as much as if the nominee was picked in the old smoked filled rooms. Giving the nomination to a candidate who could not win the nomination fairly led to a weak candidate who could not win the general election. Clinton lost because she was a terrible candidate who ran a terrible campaign. This had nothing to do with Russia. Donald cHump's Enquire rag didn't help much either. More will come out every day. Open the safe.